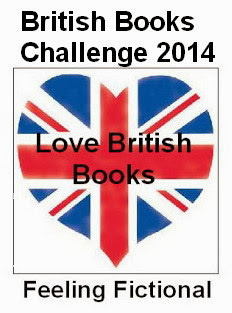 I'm very excited to announce that I'm going to be continuing to host the British Books Challenge in 2014! I hope that everyone who has taken part in the past will continue to participate and it would also be fab to see some new people joining us - come on you know you want to! The BBC is a reading challenge that was created by Becky from The Bookette in 2011 as a way to encourage people to read more books by British authors. The challenge was taken over by Kirsty at The Overflowing Library for 2012 and has been hosted here at Feeling Fictional since 2013. The books can be in print or out. Old or new titles. They can be from any genre and for any age range. Becky and Kirsty's blogs both focus on YA books but I read a mixture of adult, NA and YA so you can expect to see reviews of both on my blog. Obviously it's entirely up to you if you want to read adult, NA, YA or children's novels - or a mixture of them all! If you sign up for the Challenge you will be aiming to read at least 12 books by British Authors (which works out to one a month). For every book you review each month you will get an entry into the draw to win a monthly prize pack. Therefore the more you read the more entries you will rack up. Towards the end of the year I hope to do some kind of special prize draw for those who have gone to the most effort over the year managing to read 50 or more British Books. As prize packs are mainly being sponsored by British publishers I'm afraid that some of the prizes will only be available for UK participants but I hope that international bloggers will still take part. I will try to host a couple of international giveaways throughout the year but it will depend on finances and whether I can afford postage costs for sending out the books. If you have any questions about the challenge then make sure you check out the FAQ page HERE. I have to say a massive thank you first to Becky for originally creating the challenge and also to Kirsty for hosting it in 2012. They have both put in an incredible amount of work to promoting British authors and I hope I can do half as well as they did next year. Special thanks to Kirsty for letting me pretty much cut and paste her FAQ and sign up pages! Write a post or page on your blog linking back to this one. In that post/page write a list of the titles you hope to read. If you are not yet sure, just add one or two and update as and when you read titles with hyperlinks to your review. Insert the BCC button onto your sign bar. To do this save the button you like onto your computer, then go to add gadget on your sidebar to put the picture on your blog adding a hyperlink to it of the url address for this post. Fill out the Mr.Linky form below, make sure the link you add is directly to your sign up post and has your blog name as the title. Links to anything other than sign up posts will be deleted and only people who have created a sign up post will be eligible to win the monthly prize pack so this is very important! Please enter your blog name and the link must go directly to your sign up post. Please the button to your sidebar and link it to this sign up post so that more bloggers can join in the fun! Sorry Michelle, I didn't realise you were interested in hosting the challenge! When Becky was looking for someone to take it over I was under the impression that only Kirsty, Sammee and myself were interested so the three of us agreed to pass it around between us. Sammee was due to take over for 2014 but as she's in a blogging slump she didn't feel up for taking it over, Kirsty has a lot of other things going on so I agreed to keep it for 2014 and one of them would have it for 2015. If you want to take it over starting from January that's fine, I'll delete the sign up post & you can create a new one? I'm a bit of a techno idiot and have linked to my website rather than a specific page within my blog category where I'll be doing the reviews. Hope that's okay. Any advice welcome! Yes indeed, I shall be your guest again either way. You're a sweet person with whom it's a pleasure to play the game. :) Should you wish to be my guest, 3 challenges of my own premiere February 1st! I run to February 2015 so there's no rush anywhere near Christmas. I will mention your suggestion to my contacts when I'm talking to them about prize packs but I know from personal experience how much it can cost even to send just 1 book internationally (I've spent a fortune on postage since I started my blog & just can't afford to do it any more which is why most of my giveaways are now sponsored ones). I think most of the giveaways I've seen on US blogs are usually US or US & Canada only so I do understand your frustration. I'm glad you're still going to take part in the British Books Challenge though! Hi everyone, looking forward to reading lots of British books again this year! Hi Beth, great to have you on board again this year :o) I hope you find lots of fab books to read! Oooh I'm so glad I've stumbled upon this! I have a few reading challenges I'm taking part in this year, so I'm happy to add this on :D we need to spread the word about British authors, especially in contemporary / YA circles! I'm so happy that we have so many challenge regulars who take part every year :o) I hope you enjoy this one as much as all the others! Def. joining this:) will go check titles, write post come back - are non fiction books allowed? cannot seem to get this comment up - so if there are half a dozen I apologise:( I am def up for this challenge - will go check titles, write post and return - are non fiction books allowed as well as fiction? Sorry if you had problems commenting, I have it set up so I have to approve comments on blog posts from more than 2 weeks ago because that is where I get most of the spam comments. I try to check once a day in case any comments are waiting for approval though! Read so many last year, but was waiting to post my reviews at year end. MoM passed away, and I wasn't online for months, so there went all the reviews! Been meaning to do this for years! Been meaning to do this for years! I do love British books! Thanks again for letting me join the challenge ! Hi, bit late to the party, but I'm joining in! I just started blogging last month. (: Hopefully this challenge will get me to read more British books! I used to read lots and lots when I was younger but that's kind of changed. Hi, we are incredibly late to the party but we have "officially" blogged about 4 British Books so far this year so I have added those to our list, I hope you don't think we are cheating :) We are currently working through The BBC Big Read Top 200 so should have contributions to make for a good while to come. We cannot wait to be part of a larger community. Hi I've just joined but my join-up post isn't scheduled to go live until 24th July, hope that's OK. I've already read 13 British books since starting my blog in April so I'm feeling confident at hitting around 40 books by the end of the year. I think this is a great idea, well done for organising. Just written my post - had some trouble linking the button, but did include two other links that come back to your sign up page. Hope that works. Hi Cody, welcome to the challenge :o) I hope you enjoy taking part & don't worry too much about the button!